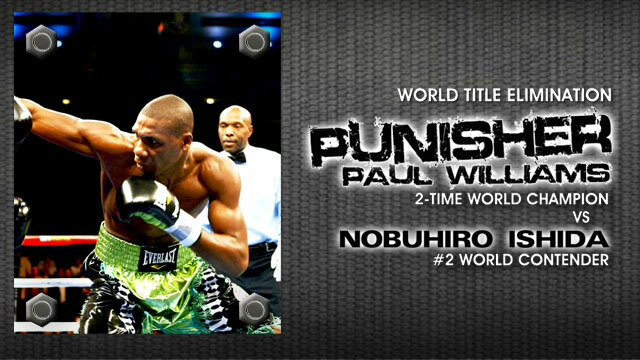 Paul Williams Vs Nobuhiro Ishida: Last chance for Williams. With a devastating knockout loss to Sergio Martinez, and a very poor performance against Erislandy Lara, Williams is now taking on Nobuhiro Ishida in a do or die fight for both Williams and Ishida. Ishida made a name for himself by shocking the boxing world when he stopped then unbeaten James Kirkland in the first round by dropping him a total of three times. I say it is do or die fight because if Williams is to regain his old form, and get himself back Into the pound for pound list, then a good start would be to beat Ishida fair and square, and look good in doing so. A loss for Paul will technically be his second loss in his last two fights, but boxing fans will know its three losses in three for Paul, and the end of the road in the career of Paul ‘The Punisher’ Williams. And Ishida needs to win to prove that beating James Kirkland wasn’t a fluke. The best way to do this would have been to rematch Kirkland and beat him again, but Ishida wants to beat another highly rated Light Middleweight in Paul Williams. A win over Williams will tell us that Ishida means business and the branding of ‘one hit wonder’ will be removed from Ishida’s name. Even though Williams has looked awful in his last two fights, I can’t help but think Ishida doesn’t have the power to do what Sergio Martinez did, and that was knock Williams out in one punch. With a twenty eight percent knockout ratio you can’t give Ishida a punchers chance, if Ishida is going to win, it will likely be a points decision. Williams wins a lot of his fights by overwhelming his opponents with a very high punch output. At thirty six years old, can Ishida keep up the pace set by the younger Paul Williams? I don’t think he can. And for that reason alone I am choosing Williams to win a well-deserved point’s decision. Ishida has never been stopped before so Williams will really make a statement by being the first one to put Ishida on the floor for more than ten seconds. Punchbag blog takes Paul Williams by decision. Presuming they both beat their respective opponents in Nobuhiro Ishida and Carlos Molina, Paul Williams and James Kirkland should go head to head in what would be a very entertaining fight. Both throw a lot of hard, fast punches and never take a step back. It would be an entertaining fight from start to finish and with the way these two throw punches and leave themselves open for counters, a stoppage would be guaranteed. But it’s a tough ask for this fight to be made. Paul Williams and James Kirkland both have tough fights ahead, where there is a distinct possibility for the underdog to prevail. We could be watching Nobuhiro Ishida Vs Carlos Molina instead. But in a boxing fans fantasy, Paul Williams Vs James Kirkland would happen ASAP. Paul Williams Vs Nobuhiro Ishida will be shown on Premier sports; also on the card will be Tavoris Cloud Vs Gabriel Campillo and Chris Arreola Vs Eric Molina. This is a very good fight card with some very entertaining fights to watch. I’ll be happy for the winner of this bout because it means bigger and better things in their future career, and I feel sorry for the looser because the door to a world title fight will be slammed firmly shut. Plenty of reason for both to leave everything in the ring.